In order to get great sequences for a natural history movie, a wildlife filmmaker must be always well-read. That’s not enough, though. It takes time to learn about the environment, the animal itself, the relation between both and the specific behaviour you want to film. 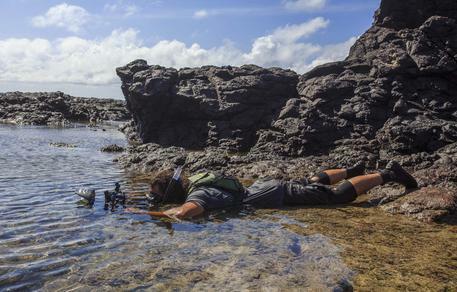 This was the case when working on the tide pool sequences at Fernando de Noronha, a Brazilian island group in the Atlantic Ocean. The tide pools’ harsh and dynamic environment is usually very hot, wet and salty, and you never know where the animals might be hiding. Although it was very challenging and tricky, I had the opportunity to shoot a sequence that has never been shot before, namely, the jumping moray eel. Lightfoot crabs begin their daily migration when the tide falls. They cross the entire tide pool, so they can feed on algae, which are normally located at the edge of the tide pool. As the edges remain most of the time submerged, algae cover them. On the way to their food, the crabs face extreme danger. Two main predators are waiting for them: moray eels and octopuses. While the octopuses chase them underwater, moray eels catch them above water. Over time moray eels developed their predator-prey system: they observe the crabs’ movement and the moment they come within reach, the moray eels jump! Since this fascinating behaviour had never been recorded before, it was my personal goal to be the first one. When you explore tide pools for the first time, it takes many hours, days or even weeks to understand this kind of environment. Every tide pool is unique, and therefore are its inhabitants. As the tide falls, they hide in smaller and deeper pools or move to the edge of the reef. When the tide rises they spread all over the place. 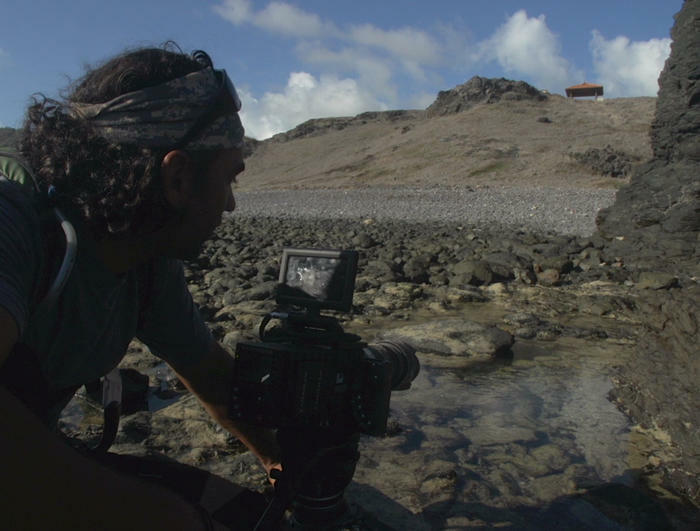 The action we wanted to film only happens when the tide is falling and the crabs are migrating to the edge of the pool. It was very difficult to be in the right place at the right time. 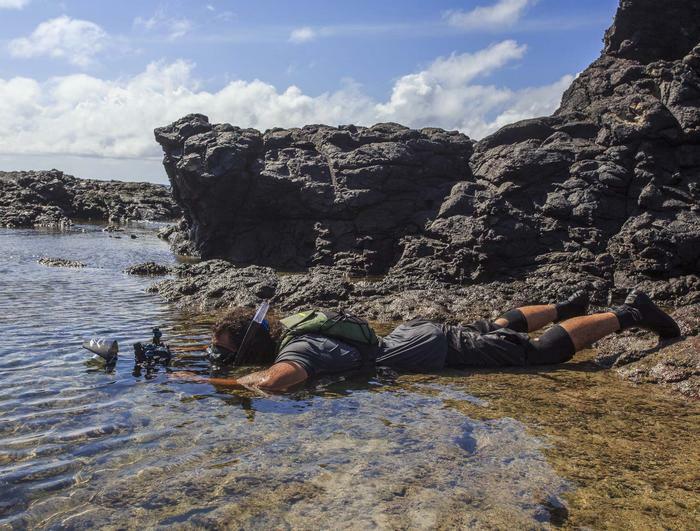 To help me on this assignment I invited João Paulo Krajewski, who holds a PhD in marine biology and had been working in this area before and also seen the specific behaviour of the moray eels. He knew the location very well, which saved us a lot of time in the learning curve. We knew exactly what we were looking for and where we could find it. Well, not so easy. Although João sensed in which kind of pools the animals could be, there were so many of them… and only one or two pools had a moray eel. The secret was to follow the crabs and look around for the action. After a few days we were getting good in locating the jumping moray eels. However, it turned out to be very frustrating because every time I saw the moray jumping and immediately set to camera to record this behaviour, the moray didn’t repeat the action. Setting the camera and starting to film whenever a moray showed itself wasn’t working at all, so during the following night João and I discussed a new strategy. 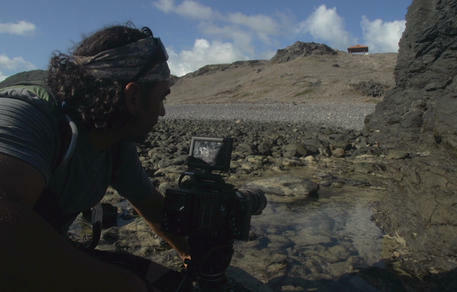 The day before, João had seen a moray eel in a pool, just before the tide covered it. He planned to check that pool at first in the morning before the crabs would begin their migration. We woke up very early and went straight to that place. 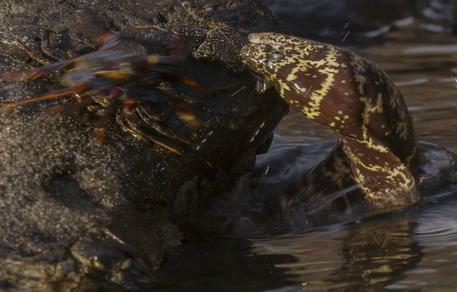 Soon we realized that the moray was there, waiting for the crabs under a rock. This seemed to be the perfect opportunity. I positioned the camera in a high-hat kind of tripod for a low angle shot, set the camera in a pre-recording mode and waited. After a few minutes, as the tide was falling, the crabs came and I was there, ready for the action. The moray eel could see the movement above the water and that was the trigger. A few crabs were on the top of the rock and the moray went straight for the lower one. The moray jumped and walked over the water. Then it retreated, waited a few more minutes before striking again. This time it ripped one leg off the crab, but still didn’t get it. I was amazed, excited and happy that I had captured all of that. But my mission hadn’t been over yet. I still didn’t get a kill. After its unsuccessful attempt the moray left the place, looking for another opportunity. We lost it in a matter of seconds and had to look for a new one. Just at that moment João saw another jump and called for me. As fast as I could I ran over the rocks, already carrying the camera on the tripod. This moray eel was jumping like crazy. Unfortunately the area was really stony, uneven and slippery. So I set the camera in the best position I was able to, framed a crab, adjusted focus and began to shoot. Just after I had pressed “rec.”, the moray jumped and caught the crab. Everything happened so fast that I was unsure if I had got the sequence. I waited to see if this spectacular action would happen again but it didn’t. So I checked the footage and was relieved to find it on tape! Mission accomplished! An unlucky crab. A dedicated camera man. I still can’t believe that all of this happened in only 30 minutes. We spent days around the tide pools and did not even get close to an opportunity like that. Except that day we were lucky to witness and record two good sequences. Later I realized that it was the hot sun on the tide pools that made it possible to get a shot like that. The crucial factor for our mission was learning about the environment and the routine of the inhabitants. It was not just about luck, it was about learning, understanding and feeling the place and then waiting for the moment when nature allowed us to capture that unique moment. Find more information about the breath-taking five-part documentary ‘Brazil – A natural History’ by following this link, where trailer, images and additional information are available.